One of Indiana’s key teacher unions says public school educators feel disrespected, and it plans to work on restoring that respect during the upcoming legislative session. Indiana State Teachers Association President Teresa Meredith says the union’s 2018 legislative priorities focus on improving neighborhood public schools and shifting the way people talk about teaching, because she says it’s one way to draw more people into the field. Part of that process, Meredith says, is also changing the way teachers are tested and evaluated. She says that could include increasing the amount of time educators have to complete content licensing exams, and evaluating effective teachers less often. ISTA’s legislative agenda features some crossover with Republican state officials’ plans for 2018, like making it easier for teachers to pass licensing requirements for different content areas – something both Gov. Eric Holcomb and Superintendent of Public Instruction Jennifer McCormick prioritize. Meredith says it makes sense, because in some cases the exams act more like a roadblock, rather than an effective licensing tool. “There are a lot of really qualified people out there waiting to teach and they are either in a situation where they have an emergency permit, or they’re teaching on a substitute license, or in some cases the school systems have offered them jobs and then pulled the job offer back because they don’t want to deal with the paperwork,” Meredith says. 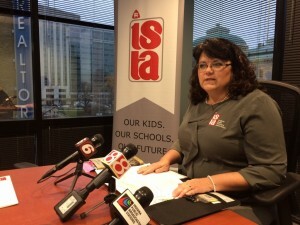 ISTA also plans to push for a lower compulsory school age, something McCormick has expressed interest in. The state requires students to start school no later than 7 years old, but Meredith says the union will also advocate for making kindergarten mandatory.